Home Money Credit Cards: How Many Is Too Many? Credit Cards: How Many Is Too Many? I have a great uncle who has 17 credit cards. I have one. Like a true story, the right answer lies somewhere in-between. I’ve written quite a lot about credit cards for various publications. I’ve come to some conclusions. In order to maximize perks, a person should have a 1:1 ratio of one credit card per major expense. Why? It’s because you want the most rewards per spending category. I believe this is a powerful way to manage credit cards. You get the most bang for the buck. Who doesn’t want to get great rewards in each spending category? No one. Free money is sometimes the most fun to receive. It’s like receiving a present each time you reap the rewards. 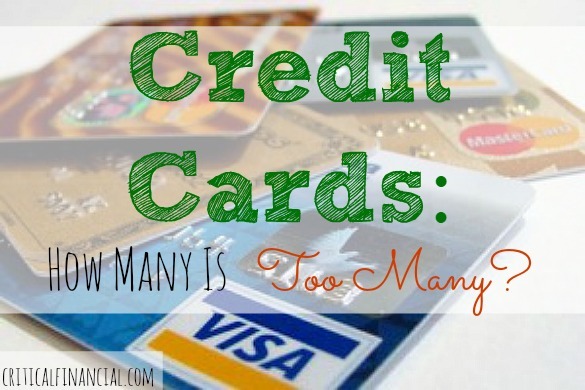 Most people sign up for too many credit cards. The first reason is because just applying for a credit card dings your score by 3-5 points. If you have 17 cards like my uncle, your credit will have taken a 68 point hit! That’s major! That could be the difference between having an excellent credit and having a mediocre ‘good’ score. What’s the customer service support number? When is the bill due each month? What kind of rewards does this card have? When will it expire if I stop using it? It’s a lot to remember. It’s also just hard to remember you own that amount of cards. I imagine the emails you’d get would be overwhelming. I’m great with email management but even I think that would be a little crazy.
) back in March. I wanted to give it a few cycles before I went after another. After all, I don’t want my credit damaged if I’m not approved. Additionally, I like having store specific cards as well. I use my Victoria Secret credit card like clockwork every month…what can I say? I’m an addict. I routinely check my victoria secret credit card login to see the rewards I’m receiving based on all of my spend. It only reaffirms my thoughts that having too few credit cards is detrimental as well. List out all your expenses as illustrated above. Next, do the research necessary to find the best card for each situation. Again, if one card is great for fuel AND groceries, feel free to use just one card for both. You’ll want to find those kinds of cards anyway. Makes things easier. Finally, to continue the discussion here is a handy little video from thepointsguy – he has about 25 credit cards and gives several reccomendations for which ones you should apply for first.